Asparagus densiflorus ‘Sprengeri’ is an evergreen arching perennial that has feathery, needle-like, stems giving an open, loose appearance in growth. Asparagus Fern is often thought of as a fern but really it is not a true fern, i.e. it produces seeds rather than spores. 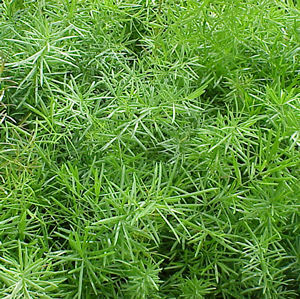 This “Fern” is however related to the vegetable Asparagus which also has fern-like foliage. In summer the plant has small white flowers that are followed by bright red berries. The plant can grow 24 to 36 inches in height and to a width of 3 to 4 feet. It will grow in sun or even fairly dense shade, however, it would prefer some shade to maintain a darker green color leaf. Bright sun tends to wash out the color leaving a more yellow plant.